This sweater was love at first sight. I saw it and I knew I wanted to knit it. I wasn't so sure about getting the original yarn from Denmark, so I chose Madelinetosh Tosh Sock instead. I really like that yarn and Strickcafé had just the three colours I wanted. 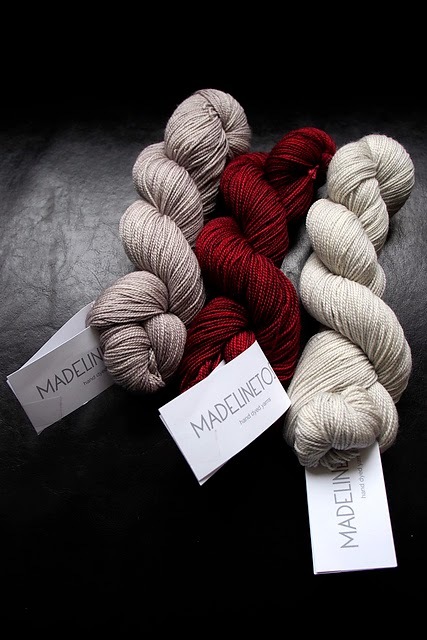 When I got the yarn I realised that the difference between the lighter Silverfox and the darker Smokestack was less pronounced than what I thought it would be, but I decided to go with it anyway. The pattern started with short rows which are kind of my nemesis, the only thing I never really manage to knit neatly. Fortunately most of it went surprisingly well, only the last wrapped stitch turned into a bit of a mess but I think it won't be that obvious. This is my first raglan sweater but I seem to do it properly so far. Now I am looking forward to using the CC1 soon. Tart has been on my wishlist for quite a while. Only about another centimetre and then I can start with the stripes. gorgeous sweater pattern and I do love the colors. Once the new year starts I'll be making a sweater. For now I have to finish all the little projects I've got on the needles. ooh, I love that pattern, yours is going to be beautiful!! I am really excited about this pattern! I've been looking at your Ravello quite often, to compare your photos from along the way. Right now, everything is really curly and messy but I think it will look good once it's done.